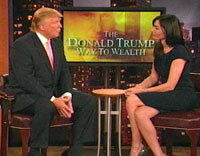 I have long wondered why a billionaire like Donald Trump would waste his time appearing on TV infomercials. After all, he doesn’t need the money and any profit derived from Trump’s “Way to Wealth” seminars must be pretty small compared to his multi-million dollar real estate deals. I had thought that Donald Trump was motivated to appear on infomercials just because he’s an incurable cheeseball. But I think I’ve found a more accurate reason. Every time a group of men gather together, they’re sure to discuss how much they wish they looked like Donald Trump. All day long in barber shops across the country men walk in asking for “The Donald,” forcing barbers to work furiously to recreate Trump’s trademark comb-over. In another part of the infomercial, host Dara Tomanovich suffers from a dry throat; rather than have the decency to edit this part out, the producers leave it in so that it appears she is overwhelmed by Trump’s glorious presence. Donald Trump may get a lot of airtime on The Apprentice and Regis & Kelly but only on infomercials which he pays for and has control of the script does he have the absolutely certainly that his rear end will be smooched non-stop. At least he’s honest about it!